There are many different approaches States employ to keep critical voices out of multilateral spaces. ISHR’s new report of 30 May 2018 [The Backlash Against Civil Society Access and Participation at the United Nations] outlines what these are and provides a road map for States and UN representatives to prevent and counter reprisals and restrictions on civil society participation in UN processes. Civil society has the right to ‘unhindered access to and communication with international bodies’. However, that right is not being respected. ISHR’s new report, ‘The Backlash Against Civil Society Access and Participation at the United Nations‘ documents a broad range of obstacles faced by human rights defenders, from opaque bureaucracies and procedures to physical threats and attacks. Even when civil society representatives make it into an actual UN building, they have been thrown out without explanation or asked to leave while events were ongoing. At some high-level events and committee meetings, NGO representatives have been barred from giving statements or bringing in documents related to their work. Physical attacks and intimidation against those seeking to coöperate with the UN are well documented. On 20 September 2017 the UN reported that a growing number of human rights defenders around the world are facing reprisals and intimidation for cooperating with the United Nations, ranging from travel bans and the freezing of assets to detention and torture, says a new report issued by the world body. “It is frankly nothing short of abhorrent that, year after year, we are compelled to present cases of intimidation and reprisals carried out against people whose crime – in the eyes of their governments – was to cooperate with UN institutions and mechanisms,” said Assistant Secretary-General for Human Rights Andrew Gilmour. “We should see these individuals as the canary in the coalmine, bravely singing until they are silenced by this toxic backlash against people, rights and dignity – as a dark warning to us all,” Mr. Gilmour told the Human Rights Council in Geneva, as he presented the Secretary-General’s report. Amnesty International has launched a campaign to publicize what it says is a worsening situation for human rights activists throughout the world. The group hopes its “Brave” campaign will persuade governments to keep the promises they made in United Nations treaties to protect defenders of human rights. The organization Front Line Defenders says 281 people were killed in 2016 for defending human rights. In 2015, the number was 156. Guadalupe Marengo, head of Amnesty’s Human Rights Defenders Program, told the VOA that “In the current context of us-versus-them, of demonization, of full frontal attack actually I would say on human rights, it is crucial that we take stock and that we call on the authorities to stop these attacks immediately.” …….Amnesty says human rights defenders are arrested, kidnapped and killed around the world. It says they are also attacked using online technology. Surveillance tools are used to study their activity. Marengo says campaigns launched on social media tell lies about the activists in an attempt to cause others to oppose them. “They are accused of being terrorists; they are accused of being criminals, they are accused of defending ‘immorality.’” Amnesty International hopes the “Brave” program will show the worsening situation for human rights activists worldwide. 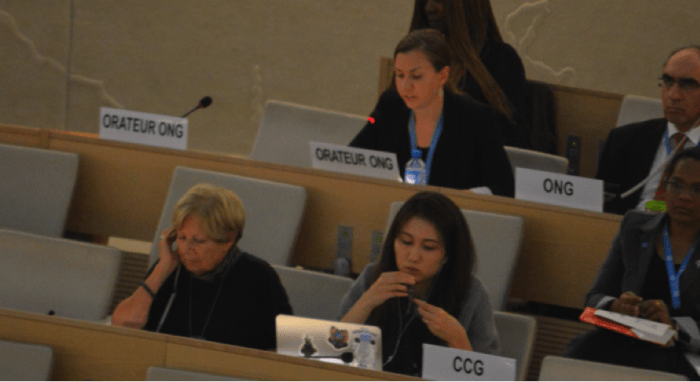 To underscore the point the NGO CIVICUS made a statement to the same (36th) UN Human Rights Council based on a panel discussion on the rights of indigenous people. “I read this statement on behalf of 39 human rights defenders and civil society organisations working on indigenous, land and environmental rights from 29 countries who met in Johannesburg, South Africa from 7-9 August 2017 to discuss strategies to advance the protection of indigenous, land and environmental rights activists. Mr. President, 2016 surpassed 2015 as the deadliest year on record for those stood up against land grabbing, natural resource exploitation and environmental destruction. Worryingly, the number of killed has risen to 200 from 185 in 2016 and spread to several countries across the world. In the current global climate, where repression of the rights to freedom of expression, association and assembly is becoming the norm rather than the exception, environmental and land defenders are particularly vulnerable. When we express concerns over the collusion between States and corporate actors, we face opposition – dissent is stifled and criminalised, and our lives are threatened. Often our work is discredited and we are labelled ‘anti-national’ and ‘anti-development’. When we protest peacefully against this attack on our resources and livelihoods, we face violence from state authorities, private security groups and state-sponsored vigilante groups. When we stand up to defend the rights of our communities, we face unfounded criminal charges, unlawful arrests, custodial torture, threats to life and liberty, surveillance, judicial harassment and administrative hurdles, among other actions. Mr. President, our families are threatened into silence and many of us have had to make the difficult decision to flee our homes and go into exile, retreating from a fight that has become too dangerous. We need global action to counter the threats we face. …While there are strong laws aimed at protecting people’s rights, those laws too often fail to be applied. At the same time, big businesses have amassed great power and influence; they are armed literally and figuratively with high-value law firms, auditors, security experts, and investigators to defend their interests. Facing that kind of arsenal, it is difficult for individuals and organizations to fight back. …South Africa needs to revise court procedures to make it easier for judges to scrutinize frivolous lawsuits without dragging the defendants into court. Second, civil society must recognize that SLAPP lawsuits are not isolated, but are part of a broad and purposeful strategy to distract and disable environmental activists and empower corporate interests. The Human Rights Council President and Bureau to clearly outlines steps the Council will take on receipt of information about credible risks of reprisals. Treaty bodies to fully adopt and implement the San Jose guidelines. The Assistant Secretary-General to ensure that rights holders and victims are kept regularly appraised of the status of their case. On the same day ISHR published a statement to the 35th session of the Human Rights Council, ISHR calling for a stronger focus on the implementation of Universal Periodic Review recommendations and the development of processes to ensure civil society can freely engage without fear of intimidation and reprisal. ‘Civil society is not only necessary for developing recommendations, but is essential for the working towards the implementation of these recommendations. The role of civil society must therefore be protected and enhanced’, said ISHR. While recommendations received are often accepted at ‘Geneva level’, implementation of these recommendations on the ground remains patchy. Item 6 on the agenda of the UN Human Rights Council provides a opportunity for dialogue on implementation. Alleged cases of intimidation and reprisals of human rights defenders engaging or seeking to engage in the UPR have escalated. ISHR received reports of cases in Egypt, India and Venezuela in the past year. Ongoing reprisals in Bahrain are particularly concerning, including the imposition of travel bans on 27 defenders during the 27th UPR pre-session – including Sayed Hadi Al Musawi – as well as the interrogation of Abtisam Alsayegh in relation to her UN engagement. ISHR’s statement reiterated calls for States to ask advance questions, and make recommendations about the prevention, investigation, prosecution and remediation of reprisals. 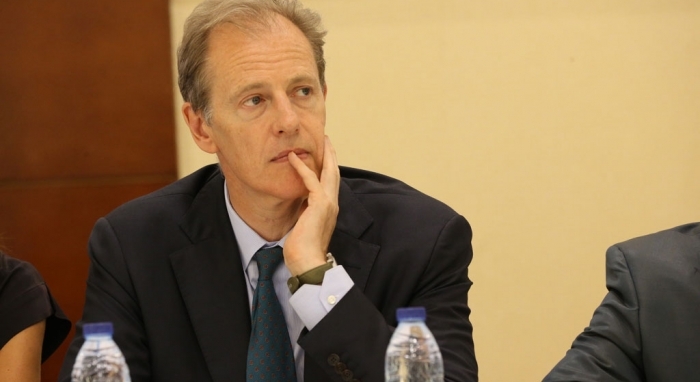 ‘Reprisals against human rights defenders for their engagement with the UPR remain worryingly prevalent,’ said McEvoy. Given civil socity’s fundamental role in the UPR, we call on the President, Bureau and Secretariat to establish an institutionalised reprisals mechanism to prevent, investigate, remedy and promote accountability for reprisals associated with the UPR’, McEvoy continued. These calls form part of ISHR’s broader strategy to strengthen the UPR which can be accessed here. Contact: Tess McEvoy, Programme Coordinator and Legal Counsel, and focal point for ISHR’s UPR advocacy, on: t.mcevoy@ishr.ch. Karla Avelar, advocating despite the danger. Six times in two years. Human rights activist Karla Avelar has been forced to move home six times in the last two years after being physically threatened by individuals she believes are gang members and for her work as a human rights defender in El Salvador. She’s a leading advocate for the human rights of LGBT people, founder and head of COMCAVIS TRANS, an organization known for its work for transgender people for nearly a decade. It’s dangerous, unpopular work, and Avelar is regularly targeted and threatened. A couple of weeks ago she was forced to move home when people tried to extort from her possible prize money for the Martin Ennals Human Rights Defender Award, for which she is a finalist. The award’s winner will be decided and announced in October, but news of her nomination has prompted these latest threats. It hasn’t been an easy life. She was shot in two separate incidents, spent five traumatic years in jail and has been a constant target of abuse for being a transgender woman. Avelar told my colleague Mariel Perez-Santiago at her office in San Salvador last year how she had been raped by more than a hundred men on her first day in prison, and that the attacks continued with the complicity of prison staff. She became a formidable advocate for the rights of trans people in and out of prison, helping to win important reforms in the prison where she used to be an inmate. 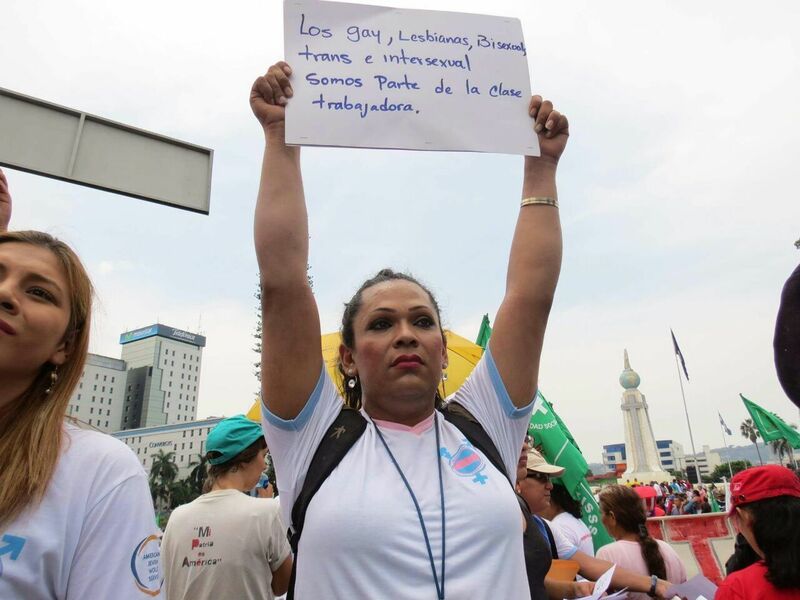 Thanks to her campaigning, transgender women are now separated from men in different wards, and human rights organizations are allowed access to the prisoners to educate them about their rights. She also represented El Salvador’s LGBT civil society at the country’s 2014 Universal Periodic Review at the United Nations in Geneva. Her profile has meant that the threats against her are receiving attention, and the Attorney General’s office has been in touch with her to discuss issues of her safety. But for Avelar and others in El Salvador’s LGBT community the risks are daily and grave. She estimates around 600 cases of unsolved murders of LGBT people in the country over the last 25 years. Forced to leave her home again and again, she’s asking for protection as well as international visibility. Making her more famous won’t guarantee her safety but we can try to help by sharing her story with whoever we know, by showing that we’re watching, and by saying that she should be protected and never be forced to move again. The report consists of a compilation of cases of intimidation and reprisals due to cooperation with the United Nations organisations and its specialised agencies in the field of human rights, including cases in relation to the Human Rights Council, its Universal Periodic Review and Special Procedures; Human Rights Treaty Bodies; the Office of the High Commissioner for Human Rights, its field presences and Human Rights Advisers; United Nations Country Teams; human rights components of peacekeeping missions and other parts of the Secretariat or specialized agencies working in the field of human rights. When submitting cases please ensure consent has been obtained from the alleged victim or his/her family and this is clearly indicated in your email; meaning 1) the victim or his/her family has been informed and has understood the possible security risks, and 2) the victim or his/her family has agreed to have his/her case included in the reprisals report; Mention is made of whether or not the alleged act of reprisal has been referred to in any official UN publication (UN report, press release, public statement, video of UN conference etc.) and, if so, the reference to this publication, including document symbol number where relevant, is provided. The report also contains a section on follow-up. Hence information in follow-up to cases included in the 2014 (A/HRC/27/38), 2015 (A/HRC/30/29) and 2016 (A/HRC/33/19) reports is also welcome. This information could for instance concern continued acts of reprisal or indicate measures that have been taken by the relevant State to investigate or prevent future reprisals from occurring. Please note that also for follow-up information the three requirements mentioned above must be adhered to. Bahrain shows again how important this exercise is: According to Front Line Defenders there is a clear pattern of preventing HRDs to attend to the human rights sessions: From 24 to 25 April 2017, twenty-two human rights defenders in Bahrain were interrogated by the Bahraini authorities. All defenders received police summonses on 21 April 2017 to appear before the office of the General Prosecutor. Most of the human rights defenders who were summoned for interrogation received confirmation that the Public Prosecutor has issued travel bans against them. The interrogations, which lasted on average 3 to 7 minutes, were in relation to allegations that the human rights defenders had attended an illegal gathering in Diraz village sometime between 2016 and 2017. Ebtisam Al-Saegh and Hussain Radhi were among the twenty-two human rights defenders who were summoned, interrogated and later received confirmation that they were subject to a travel ban. In a separate case on 20 April 2017, Sharaf Al-Mousawi was prevented from traveling to attend a meeting on development in Lebanon. The interrogations precede the upcoming Universal Periodic Review (UPR) session which will take place in Geneva, Switzerland, on 1 May 2017. Ebtisam Al-Saegh is a Bahraini human rights defender who works for the organisation Salam for Human Rights and Democracy. Hussain Radhi is a human rights defender who works for the Bahrain Center for Human Rights (BCHR) and Sharaf Al-Mousawi is President of the Bahrain Transparency Society, a non-governmental organisation promoting transparency and the elimination of corruption in Bahrain. The organisation is also a partner organisation of Transparency International. On 25 April 2017, the Public Prosecution interrogated Hussain Radhi after he received a summons on 21 April 2017 by the Bahraini security forces. He was interrogated for three or four minutes and accused of participating in an illegal gathering; allegations which he denies. While returning from a trip on 20 April 2017, Hussain Radhi was informed upon his arrival at the airport in Bahrain that on 14 April 2017, a travel ban had been issued against him by the Public Prosecution. Twenty-one other human rights defenders faced the same situation between 21 and 25 April 2017. On 24 April, Ebtisam Al-Saegh was also interrogated for three minutes after waiting for a couple of hours at the office of the Public Prosecutor. A Police force made up of six vehicles came to her home on 21 April and delivered a summons for interrogation at the Public Prosecutor’s office. The human rights defender then inquired with the Bahraini Immigration and Visas Office about her ability to travel and was informed that she faced a travel ban by order of the Public Prosecutor. Among the other human rights defenders who were interrogated, and informed that they are banned from travel, are Abdulnabi Al-Ekri , Mohammad Al-Tajer , Enas Oun , Rula Al-Safar , Jalila Al-Salman , Zainab Al-Khamis , and Ahmed Al-Saffar . All 22 human rights defenders were accused of participating in illegal gatherings between October 2016 and January 2017 in the village of Diraz. All denied the charges and several noted that it would be impossible for them to even enter Diraz as it is blocked by checkpoints manned by security forces. The human rights defenders seem to believe that the summonses and interrogations were used to justify the travel bans ahead of the upcoming UPR session in Geneva, Switzerland, in an attempt to deter their legitimate and peaceful work to protect and promote human rights in Bahrain and participate in international human rights mechanisms as is their right. In November 2016 <https://www.frontlinedefenders.org/en/case/ebtisam-al-saegh-summoned-interrogation&gt; , several human rights defenders, including Ebtisam Al-Saegh and Hussain Al-Radhi, were interrogated and prevented from traveling ahead of that month’s Human Rights Council session. See also: http://www.omct.org/human-rights-defenders/urgent-interventions/bahrain/2017/04/d24314/ which contains a Joint appeal (of 25 April 2017) signed by 60 organisations around the world to release human rights defenders Nabeel Rajab and Abdulhadi Al-Khawaja who both require adequate medical care. contact: Md. Ashrafuzzaman, Main Representative, Asian Legal Resource Centre, Cell: +41 (0) 766 38 26 59, Email: zaman@ahrc.asia . Background: Human rights defenders across the world today have to overcome restrictive and challenging circumstances to undertake their mandate. These challenges could be broadly classified into three categories. They are: (i) restrictions imposed through statutes or regulatory processes; (ii) false accusations and fabricated cases registered by the state against HRDs and their organisations; and (iii) threats presented against HRDs by non-state actors, including fundamentalist religious forces. Of the above three categories, the first and second could be overcome to a large degree at the national level, had the criminal justice institutions in Asian states been independent, and are able to decide upon cases that these institutions are called upon to engage upon. Asian states today often enact legislations to restrict the operations of HRDs and the organisations they represent. China for instance, has legislations that directly impede the operation of HRDs . Indeed, the law does not prohibit the operation of ‘foreign’ NGOs, but stipulates obtaining permissions from different state agencies before commencing work, and has cast a broad net that prohibits organisations from engaging in activities otherwise considered to be human rights work, including: advocacy, legal assistance, labour, religion, and ethnic minority affairs. State agencies are given unbridled powers to interpret an activity as one under any of these prohibited criteria. The situation of domestic NGOs, including lawyers is worse in China even before the enactment of the new ‘foreign NGO’ law. The government has imposed heavy scrutiny and restrictions upon domestic NGOs, and often detain HRDs and lawyers on criminal charges. China however is not an exception in the Asian region. Thailand for instance has legislations in place even prior to the military coup that restricts HRDs and civil society work. Thai state has spared no resources to oppress HRDs, often using the law against defamation that has penal provisions, interpreted at the will of the state by the country’s courts. After the coup, the National Peace and Reconciliation Council has promulgated ordinances that literally restrict all forms of freedom. HRDs who campaigned against the military’s version of the current Thai constitution, and the namesake referendum that was organised by the military, were arrested and imprisoned. Bangladesh, against all its obligations under domestic and international law detains HRDs, forces closure of civil society organisations by repeatedly raiding their offices and seizing office equipment and documents, and does not allow these organisations to operate their bank accounts. India too engages in similar tactics against civil society organisations that openly criticise the government and its policies. Similar circumstances exist in most other states in the region, including Singapore, Myanmar, Indonesia, Sri Lanka and the Philippines. In Pakistan, the state is engaged in a shadow war against the civil society using right-wing religious forces, including right-wing media, that has systematically targeted HRDs who have advocated for democratic governance, and in particular urged the country\’s military from illegally and arbitrarily intervening in civilian administration. In all the above circumstances, what is witnessed is the increasing role played by the entire criminal justice apparatus in Asian states that collide with the state in repressing HRDs and civil society work. Asian states liberally use their agencies like the police, prosecutor\’s office and other specialised agencies to obstruct HRDs in their work, often alleging false criminal charges against organisations or the staff members of these organisations. On the other hand, Asian judiciary has repeatedly failed to intervene in these cases despite the civil society reaching out to the courts for justice. In instances where restrictive legislations are enacted or executive orders issued, restricting civil society freedom, the judiciary has the responsibility to intervene, and if necessary, annul the law or the executive order holding it as one against constitutional rights and the state\’s obligation under international human rights law. Instead, the Asian judiciary often support state actions. Instances where cases are adjourned without a decision being made are common. Improving Asia’s human rights standards is not possible without radical reforms brought into the region’s justice delivery framework, particularly of the criminal justice procedures. The absence of independence and professionalism of Asia’s justice architecture is the cornerstone upon which impunity is built in the region. Asian states are aware of this and has consciously kept their justice institutions under direct control. Today Asian HRDs and the entire civil society in the region suffers due to this. Effective judicial intervention in instances where the state exceeds its mandate and stifle civil society work is an exception than a norm. The side event organised by the Asian Legal Resource Centre, along with The Right Livelihood Award Foundation is an attempt to expose the dubious role played by Asia’s justice institutions in stifling civil society work in the region. The event is also an attempt to raise awareness about this scenario in the global human rights community and to seek support to address this problem. On 6 January 2017 the International Secretariat of the World Organisation Against Torture (OMCT) requested urgent intervention in the following situation in Greece.